Advancing autism care remains a global priority, as over 2000 scientists, clinicians, trainees, and self-advocates gathered last week from May 9-12th at Rotterdam, Netherlands, for the 2018 International Society for Autism Research (INSAR) Annual Meeting. Now in its 17th year, INSAR brings together top ASD researchers and clinicians from around the world to exchange and disseminate the latest scientific progress in autism research. 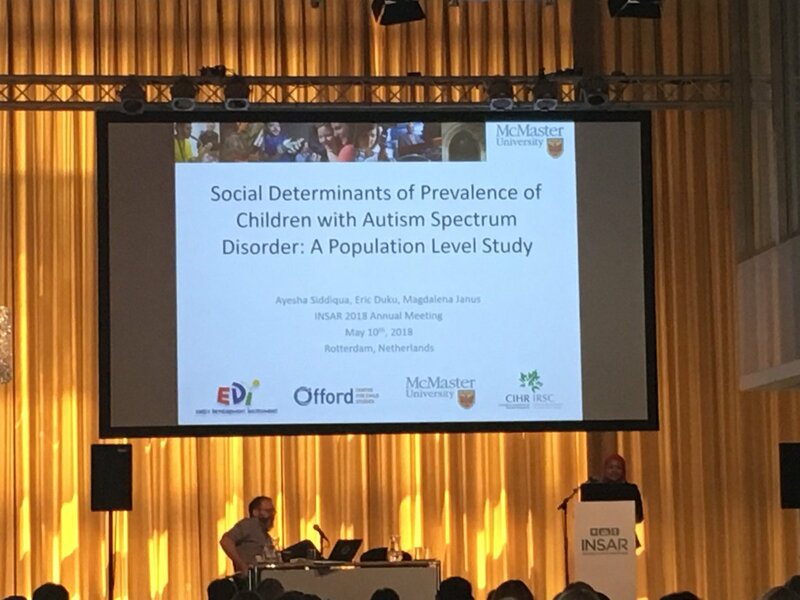 Excellent representation of MacART at INSAR gave members the opportunity for extensive collaboration and exchange of research within the international autism community. We are pleased to see many more presentations by MacART members this year than last! Do Repetitive Behaviours and Restricted Interests Predict Later Cognitive Ability in Children with Autism Spectrum Disorder? Is Early Verbal and Nonverbal Language Gain Related to Autism Spectrum Disorder’ Symptomatology in Infants at Risk? Research was featured on a panel focusing on new methods and discoveries surrounding the female autism phenotype.